If your customers and employees are sweating in the summer heat, running your Longview, Texas, business effectively will be almost impossible. This means that it’s time to look into replacing your commercial air conditioner before a permanent breakdown occurs. This will be more cost-effective than continuing to pay for numerous repairs. Today’s systems are much more efficient, so you can save money through lower utility bills after your initial investment. 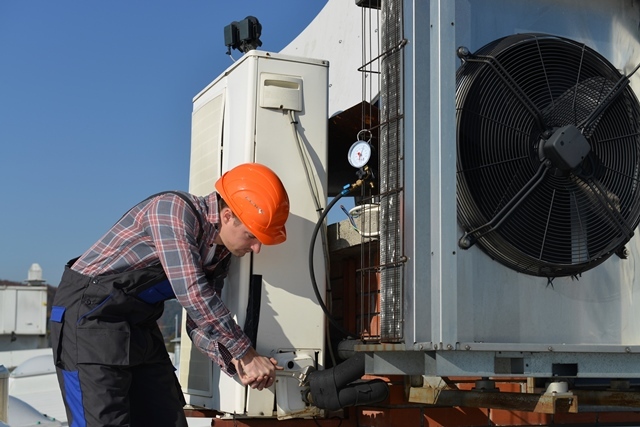 Here are some common signs that your business needs a new commercial AC. Most HVAC systems last for 10 or 15 years before major problems appear. If your air conditioner is more than ten years old and needs more than just a minor repair, you should go ahead and replace it with a more efficient and reliable unit. Older air conditioners use a refrigerant called R-22. Since it harms the ozone layer, manufacturers must stop making or selling it in the United States by 2020. The new refrigerant, R-410A, saves energy, and it’s better for the environment. However, it won’t work with older systems that used R-22. Since the price of R-22 is rising quickly, replacing your air conditioner will be less expensive than any repairs that involve adding it to an older system. A commercial air conditioner in good condition shouldn’t need more than one or two minor repairs every year. If your system needs frequent repairs from a professional, it’s reaching the end of its life. Your air conditioner’s components wear out at different rates and parts will fail in quick succession when your system is close to no longer working at all. If an inexperienced technician installed your commercial system incorrectly, you could experience this problem before your air conditioner is ten years old. Also, businesses like warehouses and factories may need to replace their HVAC systems more often because of large amounts of dust, dirt, and other pollutants in the air. Air conditioners need to use more energy as they get older because the wear and tear and from routine use reduce their efficiency. Since your system has to stay on longer to keep your business at the right temperature, your utility bills will increase. A problem that needs repair can also increase your power bills. Older air conditioners also have lower SEER or Seasonal Energy Efficiency Ratio ratings. Systems with higher ratings need less energy. The minimum SEER for new air conditioners is 13 and air conditioners are available with ratings as high as 23. If your system is more than ten years old, it probably has a rating of 10 or lower. Replacing your system will lower your expenses. If you choose a compact packaged or ductless unit, your new system also won’t use valuable storage space like a closet or your business’s attic. You may need to replace your air conditioner if your business remains warm and humid no matter how low you set the temperature on your thermostat. Some areas could even be too cold. If your system is too large for your business, it will switch on and off frequently. Air conditioners also work as dehumidifiers, and your existing system can’t dehumidify your business if it never stays on long enough. Aging equipment could also leave your office humid even though it runs for sustained periods. An environment in which there is a lot of moisture or humidity, encourages mold growth that could lower your indoor air quality and damage your inventory. Your air conditioner should be fairly quiet and loud banging, popping, or grinding noises are strong signs that you need a new unit. Failing parts could even smell like something burning. These uncomfortable working conditions can affect your employees’ performance, keep your business from attracting customers, and lower your profits. JD’s A/C can help you find the most affordable, efficient commercial air conditioner for your business. We are a Carrier Factory Authorized Dealer with more than 30 years of experience and we offer a full range of heating and air conditioning services for businesses and homes. Our expert services include installation, repair, and maintenance. Call us at 903-374-4012 for excellent service from one of our knowledgeable technicians.